Here the inflatable canoe is called the Hotdog or Canoraft and the inflatable kayak is an Airyak or even an Airboat. These stable boats, adapted for rebounds against rocks bring you the joys of the autonomy in white water without the disadvantages of a kayak or a traditional canoe. To practice solo or duo, but always accompanied by our guides. Between Toulouse and Perpignan, the river Aude allows to be initiated and to improve your skills in canoe or kayak in white water. We adapt the courses according to your level of practice. 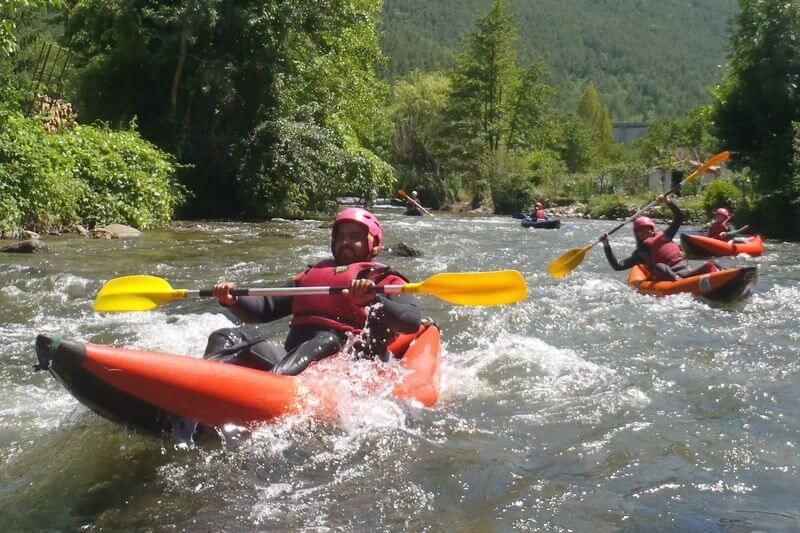 Ride your boats, alone or with somebody and experience the sensations of freedom on a white water course from the village of Axat in the high valley of the Aude, accessible for all. The appointment is made on our base, in the Camping du Pont d'Alies between Lapradelle and Quillan. The descent with its class II rapids takes you to the village of Saint Martin lys through a preserved, wild and authentic environment. With Pyrene, no surprises, it's all included ! Qualification: State Diploma of Canoe Kayak and qualification in highest levels white waters. Our isothermal equipment is disinfected after each use. Your swimsuit and your towel. We take care of the rest. Conditions: Minors need a parental consent. All participants must know swimming 20 meters.